Three wee places off the beaten track in the county of Angus. Letham is a planned village built to a grid pattern in the late 18th century by ‘Honest’ George Dempster as a new centre of the linen industry in a bid to offer affordable housing and stem emigration to the New World. The village, its social history and its environs were comprehensively and beautifully photographed by Will Forbes in the early 20th century with some of his work featured in this book. Friockheim similarly was a planned new village for the linen industry. 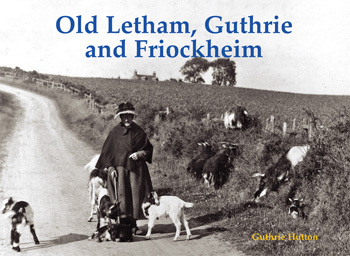 Guthrie is the smallest of the settlements mentioned in the title, the lands being named after the 15th century Sir David Guthrie, not our author as the latter would have liked! The book also includes Glasterlaw and Kinnell.